The Lucas Oil Off Road Racing Series (LOORRS) made its way to Speedworld Off Road Park located in Surprise, AZ for rounds 5 and 6, May 19-20. The action on the track was intense throughout the whole weekend and will be remembered as some of the best racing in the series’ history. Saturday kicked off the race weekend for the fans who could bear the scorching heat to watch the epic battles in all the pro classes. Pro-4 started with Team Asssociated’s Carl Renezeder and Kyle Leduc mixing it up for the entire 18 laps. Both drivers swapped the lead several times with great passes and clean hard racing. In the closing laps, Carl rolled his truck, allowing Kyle to take the lead to bring home his 5th consecutive race win this year. 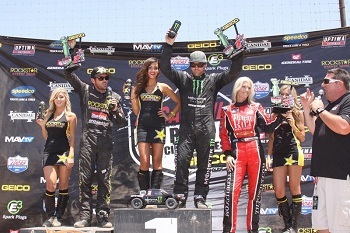 Along with Kyle, Team Associated’s Casey Currie came out with a 3rd-place finish in the stacked Pro-Lite class. The day ended with the Pro-2 class, where each team threw everything they had at the track. Drivers were racing for every inch and in some cases scraping for territory that was already occupied. Carl Renezeder was in a battle with Greg Adler and Jeremy McGrath for the third and final podium spot when McGrath landed on top of Carl on the back tabletop. After the dust settled, Carl was able to hang on to finish in 3rd position. Sunday showed the hearts of the teams as they showed up ready to race after thrashing to rebuild their damaged trucks to come out and do battle again. Pro-4 was nothing more than the Kyle Leduc show, again. Kyle started in the 6th position after the qualifiers were restacked in the invert. When the green flag dropped, Kyle quickly made his way to the front and never looked back to take the victory for the sixth time in a row, setting a new LOORRS record for most consecutive wins in a single season. Along with Kyle on the podium was Travis Coyne, who finished in the second place spot in his Team Associated Pro Comp truck. Casey Currie picked up his second podium of the weekend by finishing second in the Pro-Lite class after working his way through the field. Team Associated’s younger drivers also showed their abilities in the Modified Kart class. Blake Lenk picked up his first win after doing a tremendous job of driving and fending off past kart champion Sheldon Creed. The Modified Kart class is showing why the fields of racing are becoming more and more talented. These kids are fast, fearless, and unafraid to mix it up with their competition. The LOORRS will be heading to the pristine Miller Motorsports Complex in Tooele, UT for rounds 7 & 8 on June 23-24. Check your local TV listings and see the LOORRS schedule below for race coverage. Also be sure to check out www.rc10.com for up-to-date race results, news, and info on upcoming LOORRS events!